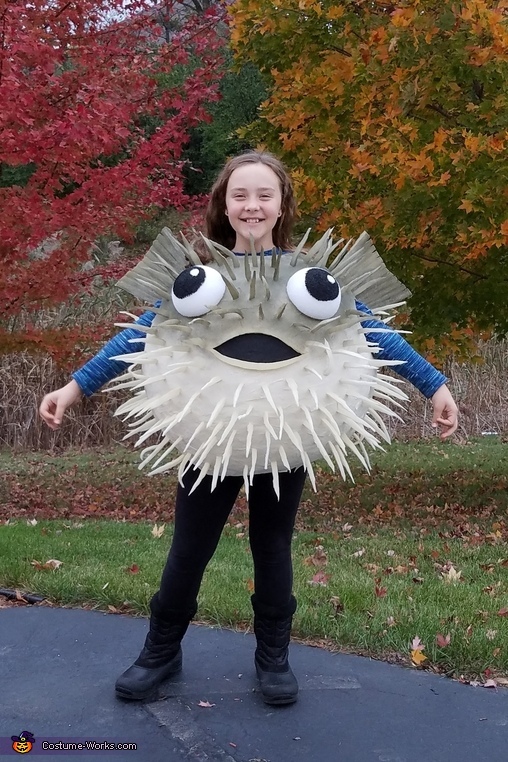 My daughter has been obsessed with Puffer fish, so we knew we would need to be creative to make her a costume this Halloween! We started with 6 layers of papier mache over an exercise ball, cut out head and arm holes, then spray painted an off-white color. We hot glued on the spikes made of dense craft foam,then sprayed a darker color on the top half. We also added fins and the mouth made from foam, and eyes made out of Styrofoam. She named him Spike and had a blast wearing him for trick or treating! Great Costume... how were you able to hold it up? Where were you able to buy the large exercise ball? I think the exercise ball was just one we bought on Amazon. We wrapped the exercise ball in plastic wrap first to make it easier to remove from the papier mache. We set it on a copy paper box lid to keep it from rolling around as we were working on it, and left a hole open in the bottom that matched up with where the air fill hole was on the ball. Once we had 5-6 layers of papier mache done, we deflated the ball and removed it. I am going to try and make this for my son. He has a play. How did you make the fins. Thank you. I did a similar thing for my daughter to be Mdme Blueberry but it did not stay on. How did you secure this to her shoulders? Thanks. The fins are made from upholstery foam hot glued on and painted. We cut the head hole just barely big enough to get her head through,so the shell just rested on her shoulders. We did put a piece of pipe insulation around the neck hole for padding. Thank you. Great idea about pipe insulation. I have never used craft foam before. Did you use a different type for the spikes than for the fins and the mouth? Did the hot glue hold them while she walked around for trick or treating? Same foam for spikes, mouth, and fins. It was a 1" thick upholstery foam. We did lose a couple of spikes, but only because of young trick or treated pulling on them. Otherwise they held well. They styrofoam eyes did not hold with hot glue, we used some roofing nails from the inside to help. How did you cut the spikes from the upholstery foam? They look so uniform. Just used a sharp scissors, like the king for cutting fabric. We cut them into long triangles, then did a bit of trimming to even them out.